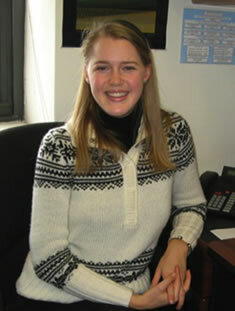 Sarah joined the Clinical Motor Physiology Laboratory in December 2010. She is responsible for recruiting subjects for research studies, maintaining study records, assisting with manuscript preparation, and helping with all laboratory functions. She received a BSN from the University of Virginia in 2008, following which she completed a premedical post-baccalaureate program at the University of Virginia. At the University of Virginia, Sarah assisted in the student-run philanthropy, Pancakes for Parkinson’s, and helped raise $40,000 over three years for the Michael J. Fox Foundation. She is active in community medicine, has served as an outreach coordinator and has worked as a registered nurse at the Charlottesville Free Clinic. She is interested in neurological illness and degenerative disease. She also has a passion for traveling and likes to utilize her knowledge and expertise in health care when she visits new places. She participated in a Global Medical Training trip to Costa Rica and Panama, and more recently, traveled to Haiti to assist with earthquake relief efforts. She is planning to attend medical school, and she is excited about a future career in medicine.